There are many benefits to adding a water feature to your property. Whether a flowing stream, cascading waterfall, or reflective pond, these elements bring beauty and value to your home or business. But don’t neglect to give it the finishing touch. 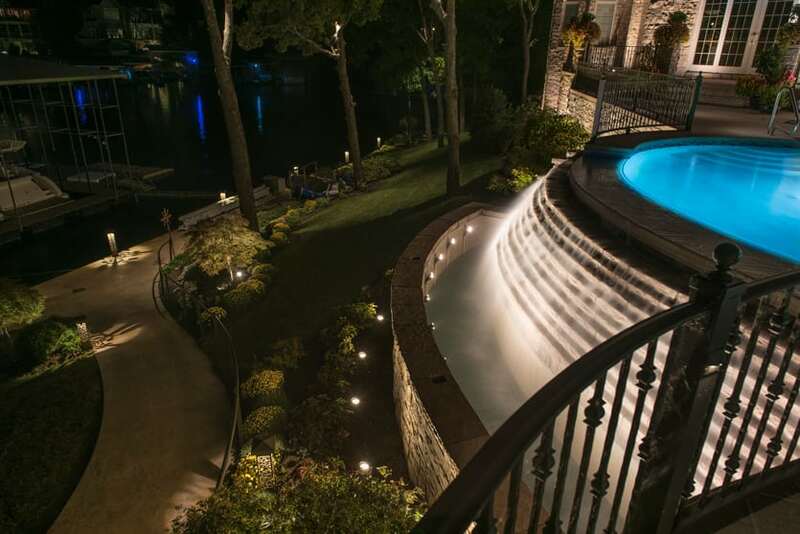 Landscape lighting adds drama to water features and brings the night to life by enhancing your lifestyle with light. Lighting adds multiple layers to your landscape design and sets a definite mood. There are many ways to call attention to a water feature with lights. You can illuminate a waterfall from behind or incorporate light fixtures into a rock wall with water flowing over it. 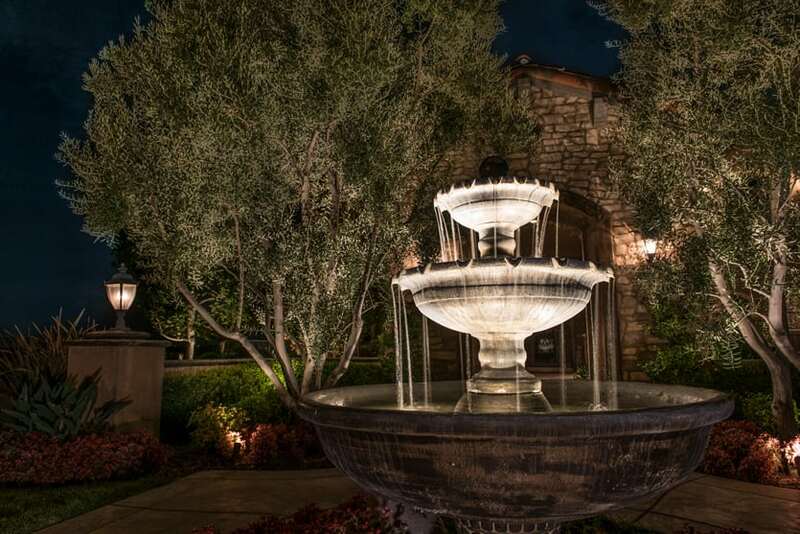 Lighting your water feature creates a dramatic visual effect, adding to the atmosphere and ambiance of your property. 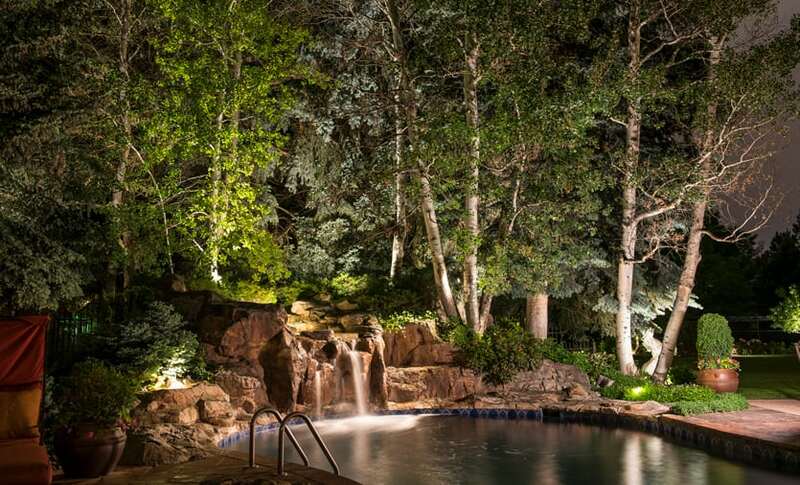 Set the tone of your residential water feature with landscape lighting. Whether you desire the feeling of tranquility and relaxation from a bowl water feature in your backyard or a grandiose welcome from a large fountain near your driveway, proper lighting creates the ambiance you’re looking for. Showcase your water feature with a lighting design that will impact viewers and set the mood. Create a powerful corporate statement with a customized lighting design for your water feature. Make your brand the focal point by adding a lit logo, special lighting sequence, or trademark colors to your design. Don’t let clients underestimate your business or value. Make them take notice the moment they see your property by showing off your exceptional water feature with landscape lighting. Lighting is as much a part of landscape design as plants and walkways. If you have an important design element such as a large fountain, it doesn’t add much if it can’t be seen at night. When it comes to water features, lighting can emphasize your beautiful water elements in ways nothing else can. Minimize lighting mistakes and cost by remembering to illuminate with a purpose. Think about how each part of your water feature will look when illuminated. 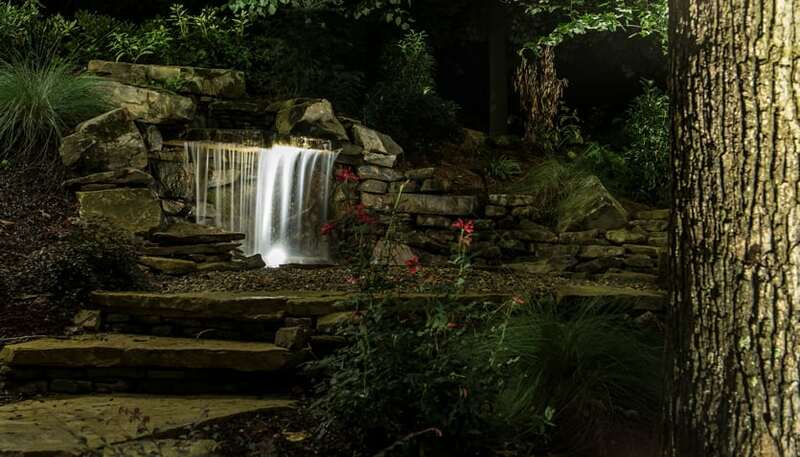 From the water to the base of your feature, your lighting should highlight the beauty and nuances that the water feature brings to your landscape design. Think about the places that your water feature will most often be viewed and enjoyed. Consider how that will affect the amount of light needed, lighting angles, and glare. If your water feature is close to a seating area, you may want to install fixtures in the fountain for a soft and subtle glow. If you can see your water feature from the road, adding spotlights will increase its visibility and create a dramatic effect. 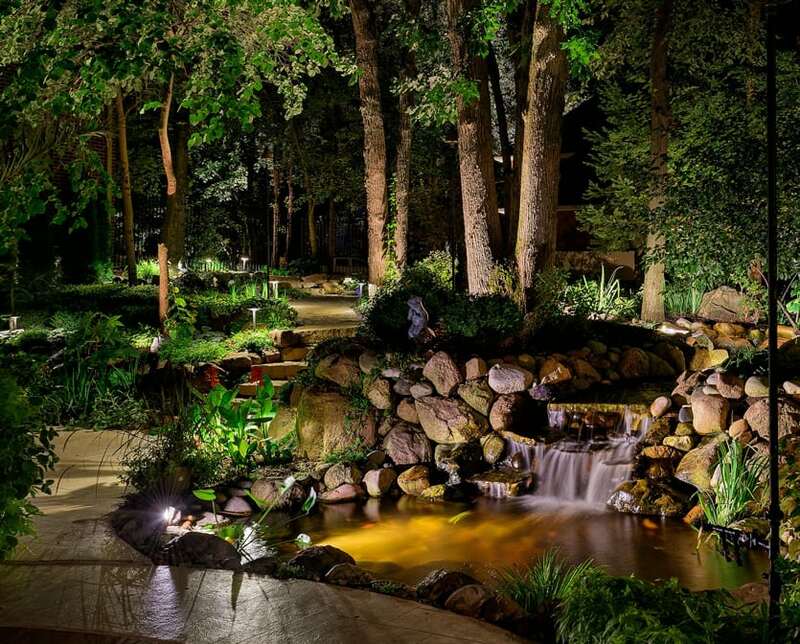 Use lighting, such as path lights, throughout your landscape to draw the eye towards your water feature as a focal point. Be conscientious while you choose lighting fixtures that they hide or eliminate glare. When lighting a water feature, start by deciding if you want lights in or out of the water. Underwater lights are affected by the clarity of the water itself. Murky water will result in dim lighting. If your pond or waterfall is well maintained and the water is clear, then placing lights underwater is a great idea. 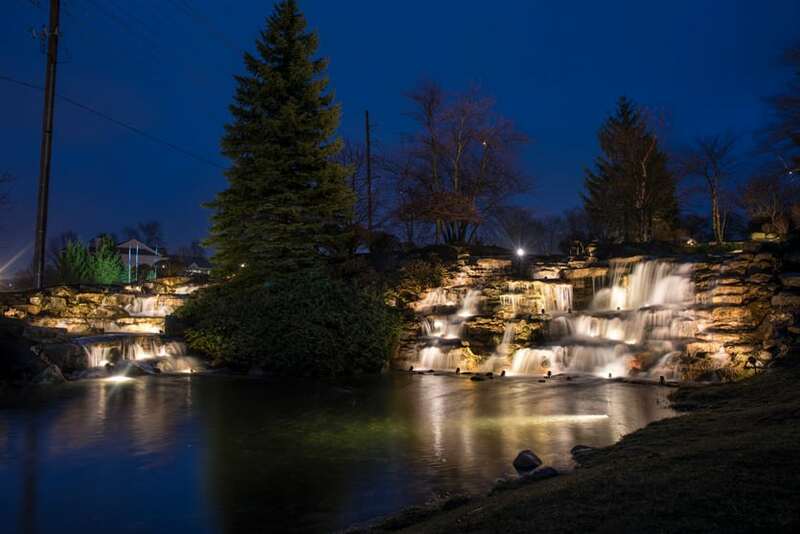 Submersible lights work well in a variety of water features including waterfalls! Use brass fixtures that are designed for underwater lighting to ensure that you are investing your money wisely on a product that will last. While underwater lighting can really capture water movement and create a spectacular look, don’t forget to add ambiance to your lighting design with above water LED accent lighting around the fountain. Any time there is a water feature on your property, you need to keep safety in mind. Clearly visible lighting on the edges of ponds and pools, for example, can help prevent falls and other injuries. Landscape lighting that shows off your water feature will lower the risk of potentially hazardous situations. Our professional staff can advise you on exactly what type of lighting is appropriate for your water feature. The right lighting is an investment in your property that reaps many rewards. You’ll enjoy its design, ambiance, and beauty for many years to come.